This beautiful hall chest is most noticeable for its intricate floral patterned open fretwork doors. They are delightful to the eye and enhance the rustic grey furniture piece as a whole. Attractive furniture, whether for a hallway or a living room, can transform a setting and literally inspire a renaissance in your home décor style. This characterful Melange Filigree hall chest is just such a piece that is versatile and timeless in its nature. A wooden hall chest like this one can be placed in a hallway, as the name suggest or alternatively it can become a feature in a living room, dining room or bedroom interior. The rustic-style of this chest can complement existing items in your home as well as offer a decorative contrast to others. It features the two floral fretwork doors as well as two smaller upper drawers. In a hall setting it can be used to store items you need close to hand when leaving and returning home, such as bags, dog leads, gloves and keys. 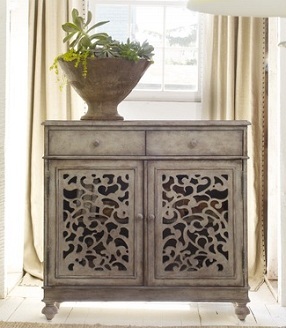 You can buy it from here: Melange Filigree Hall Chest in Rustic Gray. Also features an adjustable shelf inside. 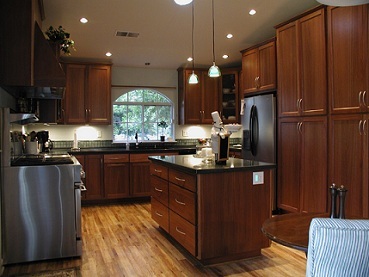 When it comes to quality kitchen cabinets and interior design, wood is the best option to go with. It’s difficult to beat the beauty, longevity and individuality of pure wood and they are far superior to wood composites and veneers. Kitchen cabinets are a major feature in any kitchen and thus getting the right look is just as important as making sure you have enough storage and food preparation surface space. A lot of entertaining also takes place in the kitchen area. So what woods are best for your kitchen and what choices are there for you to look at? Oak is one of the most majestic of trees, with its mighty branches sweeping outwards like a dancer’s robes in mid-swing. It’s no surprise therefore, that the wood from this old tree is one of the most attractive, strong and long-lasting you can possibly find. Oak wood used in the construction of cabinets will provide an eye-catching and very natural look to the interior which will match the delicious dishes created in the kitchen. Oak can be complimented with various staining processes. Unlike with other woods, pine is relatively difficult to decipher from an online perspective. That’s why it’s often best to find a store or manufacturer in your local area and go in person to look at the pine cabinets up close. Pine wood is usually seen with many knots and these can make or break a particular décor scheme you might have in mind, thus it’s important to choose from a more hands-on perspective. Although when you find the right one for you, pine wood kitchen cabinets will looking stunning and really add substance to a space. Cherry wood has a unique and innate beauty about it which makes it a popular choice for kitchen cabinets. The deep red of the wood compliments many types of décor schemes and the best thing about cherry is that it deepens in color over time and improves on its already luxurious appearance. With cherry wood cabinets, friends, family and guests will find the kitchen environment most welcoming and you might have a difficult time getting them out of the way of the cooking process. Maple wood is a light-toned wood which is ideal for kitchens which need cabinets that are not going to darken the interior. The wood is also very durable and is relatively resistant to denting and damage from every day wear and tear. However, maple doesn’t react too well to prolonged periods in the sun and soon starts to fade, so it’s wise to make sure the cabinet area will not be in direct contact with sunshine streaming through windows or glass doors. It has an attractive wood grain and is also one of the cheaper woods available. 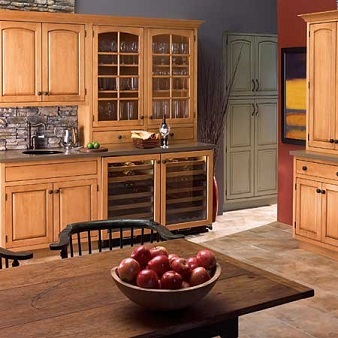 To add sophistication and majestic aplomb to a kitchen, then mahogany kitchen cabinets are a good choice. Mahogany is a dark wood and thus lends itself well to décor schemes that will make the most of the differences in tone and contrast the wood can bring. Unfortunately, mahogany wood is both expensive and endangered as a tree species. However, there are some special harvesters and exporters which work with this wood species in an environmentally sensible way and if you choose mahogany for your kitchen cabinet, then a little research online will give you more information on these agencies. One well known and respected one for example is the Forest Stewardship Council (FSC). Take your time before making a final decision and weigh the pros and cons of each wood material mentioned in this article. The wood you chose will transform your kitchen interior and it’s wise to make sure the change will be for the good. When buying a media storage cabinet it is important to calculate what size and style of cabinet you will need. Some pre-existing interior design schemes suit metals and glass whilst other interiors provide a more harmonious setting for more traditional forms of material used in furniture such as wood. This tall oak wood CD and DVD media storage cabinet as seen below is a wooden storage cabinet piece that will look great in a room where wooden furniture is the norm and will thus be complimentary to the décor already in place. CD and DVD media cabinets are ideal furniture pieces for the safe and orderly storage for items such as DVDs, CDs, video games and various miscellaneous items associated with the television, video recorder and games consoles. 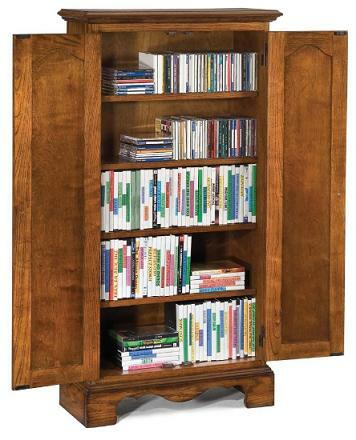 The tall oak wood media storage cabinet that caught my own eye is a smart and aesthetically pleasing cabinet which can hold up to 175 DVD’s or around 290 CD’s. Inside the wooden media cabinet are five shelves with four of these being adjustable so as to be better suited to your own individual needs. The tall oak wood media storage cabinet is made from solid hardwood which has then been fitted with warm oak veneers and a rich milti-step oak finish. A casual yet high functional furniture piece, this wood CD and DVD Media Storage Cabinet will fit in to a reasonably narrow gap next to a television or alcove. When the doors are closed, it will be yet another beautiful wooden furniture piece that will merge with the existing decor and hide the often garish CD and DVD casings inside. You can see a larger picture of what this tall oak media cabinet looks like when the doors are closed via the link mentioned below. 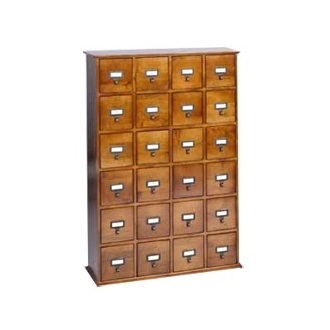 This cabinet can be bought from the following location: Tall Oak Wood CD/DVD Media Storage Cabinet. Bathroom medicine cabinets make wonderful storage areas for spare medicines, pills, tablets and syrups. When we have visited the doctors or when we are sick with a cold, we often buy medicines like there is no tomorrow and before the dose has been completed, we have recovered. Bathroom medicine cabinets therefore provide a safe, dry and space saving storage area for the surplus medicines we have in the house which we keep for a rainy day. The simple wooden bathroom medicine cabinet as seen in the picture above is an ideal wall cabinet for a wide variety of bathroom styles and sizes. It’s simplicity means it will compliment most types of ordinary home bathroom without being too heavy on the eye or spoiling the decor. In fact, this particular medicine cabinet comes in a variety of colors and finishes which include Antique White, Cognac, Dark Cherry, Light Cherry and White. For some bathrooms, a recessed bathroom medicine cabinet is a necessity due to space or existing fixtures. This simple wooden bathroom medicine cabinet can be bought as a recessed or surface cabinet depending on the type desired. if this one is not to your liking, I have showcased a number of other medicine cabinets on the following pages which include: Bathroom Cabinets: Surface Mount and also Lighted Bathroom Medicine Cabinets. 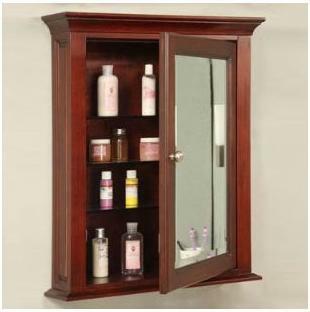 The simple wooden bathroom medicine cabinet in the picture above which comes with a single door and mirror can be purchased from the following lcoation for $546: Simple Wooden Bathroom Medicine Cabinet.